Looking for classic tube-amp-style drive? 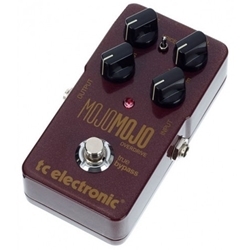 The TC Electronic MojoMojo overdrive pedal is your ticket to dynamic tube-style bliss. From bluesy breakup to screaming solos and chunky crunch, the MojoMojo covers the spectrum of overdrive boost. Just like a real tube amp, the MojoMojo responds naturally to your guitar's volume, allowing you to control the character of your drive by simply riding the volume knob. With all knobs set at their detented 12 o'clock positions, the MojoMojo provides a perfectly transparent drive with a wholly natural breakup.